Engineers at UC San Diego have built a powerful yet ultrathin digital camera by folding up the telephoto lens. This technology may yield lightweight, ultrathin, high resolution miniature cameras for unmanned surveillance aircraft, cell phones and infrared night vision applications. 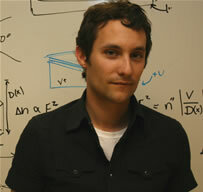 Eric Tremblay, the first author on an Applied Optics paper published February 1, 2007, and an electrical and computer engineering Ph.D. candidate at UCSD’s Jacobs School of Engineering. “Our imager is about seven times more powerful than a conventional lens of the same depth,” said Eric Tremblay, the first author on an Applied Optics paper published February 1, 2007, and an electrical and computer engineering Ph.D. candidate at UCSD’s Jacobs School of Engineering. Eric is working with Joseph Ford, a professor of electrical and computer engineering at the Jacobs School who leads the camera project within UCSD’s Photonic Systems Integration Lab. Ford is also affiliated with the UCSD division of the California Institute of Telecommunications and Information Technology, Calit2. To reduce camera thickness but retain good light collection and high-resolution capabilities, Tremblay and colleagues replaced the traditional lens with a “folded” optical system that is based on an extension of conventional astronomical telescopes that employed mirrors, such as the Cassegrain telescope, which was developed in 1672. “The folding idea was new in 1672, but they were doing it with two separate mirrors. We cut all of our reflective surfaces out of a single component and quadrupled the number of folds,” said Ford. Instead of bending and focusing light as it passes through a series of separate mirrors and lenses, the new folded system bends and focuses light while it is reflected back and forth inside a single 5 millimeter thick optical crystal. The light is focused as if it were moving through a traditional lens system that is at least seven times thicker. “When all is said and done, our camera will look a lot like a lens cap that can be focused and used as a regular camera,” said Ford. Folding the optic addresses performance issues facing today’s cell phone cameras by increasing the “effective focal length” – the zooming power of the camera – without increasing the distance from the front of the optic to the image sensor. “The larger the number of folds in the imager, the more powerful it is,” said Ford. On a disk of calcium fluoride – a transparent optical crystal – the engineers cut a series of concentric, reflective surfaces that bend and focus the light as it is bounced to a facing flat reflector. The two round surfaces with 60 millimeter diameters are separated by 5 millimeters of transparent calcium fluoride. This design strategy forces light entering the ring-shaped aperture to bounce back-and-forth between the two reflective surfaces. The light follows a predetermined zigzag path as it moves from the largest of the four concentric optic surfaces to the smallest and then to the CMOS light sensor. This kind of lens folding has not been widely implemented as a means to slim cameras down, but recent advances in the mechanical machining process of “diamond turning” are changing that. The engineers used a diamond tip to cut all the reflective surfaces onto a single calcium fluoride disk. “You mount the optic once and the diamond machining tool cuts all the optical surfaces without having to adjust the setup,” explained Tremblay. Not having to realign the optic during the machining of the reflective surfaces reduced an important source of error and helped make folding a viable approach for camera slimming. In mass production, diamond turning would be used to create a master for a molded-glass element, bringing the cost in line with the inexpensive molded glass aspheres found in current compact cameras. In the laboratory, the engineers compared a 5 millimeter thick, 8-fold imager optimized to focus on objects 2.5 meters away with a conventional high-resolution, compact camera lens with a 38 millimeter focal length. At best focus, the resolution, color and image quality are very similar between the two cameras, the authors report. One initial drawback with the new folded camera was its limited depth of focus. Digital post-processing techniques and design changes were successfully implemented in the latest generation of the camera. The authors note that this latest generation of the technology will be covered in future publications. The team is now designing variable-focus folded optical systems that have air between the reflective surfaces of the imager. Such imagers may be especially useful for lightweight, inexpensive infrared vision applications. The all-reflective systems also enable ultra-broad-spectrum imaging and thus may be useful for ultraviolet lithography – an emerging technique for squeezing more transistors onto silicon in order to create more powerful chips. This work is part of a larger Multi-Domain Optimization research team led by Prof. Mark Neifeld at the University of Arizona, which includes a related UCSD research effort on nanophotonics led by Prof. Yeshaiahu Fainman, and researchers from CDM Optics and MIT. This research is funded by the U.S. Department of Defense Advanced Research Projects Agency (DARPA) through Dennis Healy’s MONTAGE program. To create fully-functional prototype imagers, the UCSD engineers partnered with Ron Stack and Rick Morrison of Distant Focus Corporation an optical systems company that designed the camera’s electronic circuit boards and also developed the interface and control software.